I’m not quite sure why we Americans have such a love affair with chicken wings. Maybe it’s because the chicken wing can take on so many different flavors and has a convenient built-in handle. Or possibly our inner children still love to make a mess while we eat and there are fewer finger foods that have such a mess-making potential as the chicken wing. And then there’s the near ubiquitous pairing of sports and chicken wings. A big game watching party is just missing a bit of something if there aren’t chicken wings about. While I’m a fan of the traditional Buffalo wing with it’s buttery pepper sauce, and I’m not going to turn down a chicken wing bathed in BBQ sauce, I’m always on the lookout for fun twists on wings recipes so I can offer a bit of the unexpected on my game watching party table. Sriracha-Glazed Chicken Wings from Martha Stewart’s Everyday Food magazine embody that twist. Sriracha, a traditional Thai condiment featuring chiles and garlic, add spice and heat to the wings while soy sauce gives some depth of flavor. Fresh ginger offers nice back-of-the-throat burn that’s different but complimenatry to the heat from the Sriracha and honey adds a bit of sweetness to balance it all out. These wings are baked instead of fried making them less-messy and just a little better for you than a traditional fried wing. While it only takes a few minutes to whip the Sriracha glaze together for these wings, and they technically only need 30 minutes of marinading time, you can do the whipping and marinating much further in advance to give you one less thing to do just before the game starts. 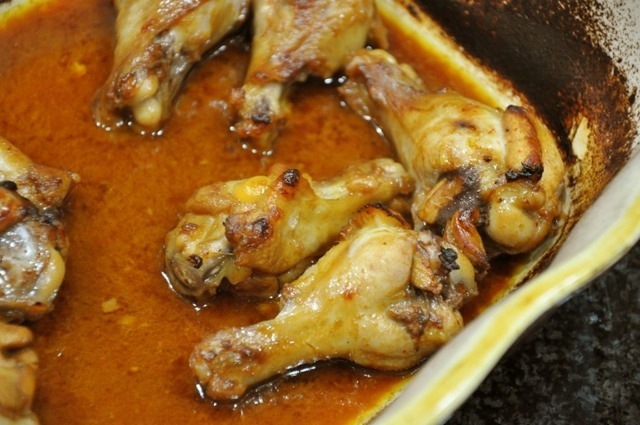 Toss the wings with the sauce the morning before the party, cover, and let sit in the fridge until you’re ready to bake them. Pull the wings out at the same time you preheat the oven so they can shake the chill a bit, then bake as directed. Freeze the wings in the marinade in a heavy duty zip-top bag for up to a month. The night before the party move the bag to the fridge so the wings can thaw safely overnight. Set the wings out on the counter while the oven preheats and bake away. Even though the name implies that these wings might be extra spicy, a single tablespoon of Sriracha really doesn’t bring that much heat to the party, particularly when spread over a pound and a half of wings. You can easily double the Sriracha or if your guests have varying levels of heat tolerance, serve some Sriracha on the side so those who so desire can turn up the heat all they want. Besides being quick and easy to put together, this recipe is easy to double or triple to serve a bigger crowd. Just be sure to use a big enough baking dish so the wings aren’t crowded while they bake or you’ll risk soggy, undercooked wings. You can keep extra wings warm in a crock pot on low so fans can nosh (or possibly stress eat) throughout the game.